Jeb Bush himself has yet to say whether he'll run for president in 2016, but his family can't seem to stop talking about it. His mother, Barbara, rejected the idea in 2013: “We’ve had enough Bushes,” she said. But son George P. Bush told ABC’s “This Week” that his father was likely to make a bid for the GOP nomination -- and the speculation was back on, louder than ever. 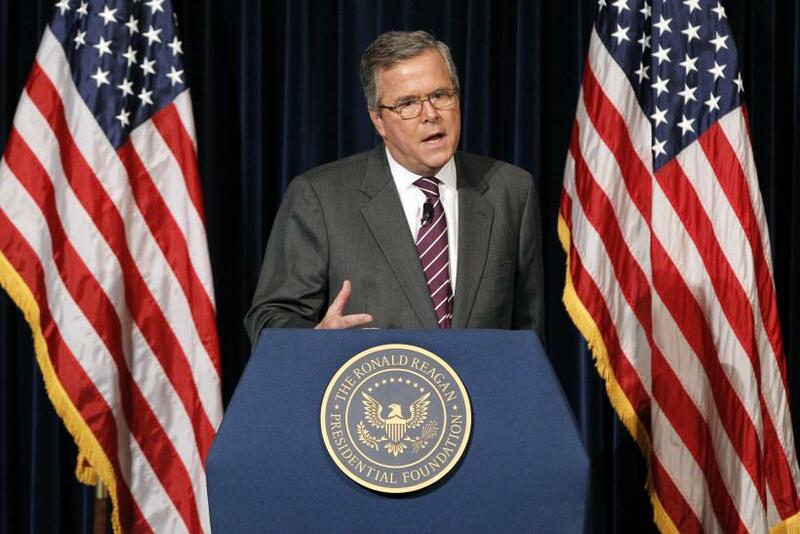 Can Jeb Bush actually get elected? Here's the political calculus. The former Florida governor appears to stand as good a chance as any other Republican hopeful of grabbing the party's nomination. He leads the GOP pack in the two most recent polls. The hardest challenge for him won't be the baggage of his last name, but his differences with his own party on two issues that are likely to play a major role in the GOP primaries: immigration and the Common Core educational standards. Six years ago it seemed impossible another Bush would be taken seriously as a presidential candidate so soon. Leaving two unfinished wars and an economy in collapse, George W. Bush appeared to have tainted the family name forever. But the former president’s approval rating has risen. A September Wall Street Journal/NBC poll found him with a 37 percent positive and 38 percent negative rating (he left office with a 31 percent positive and 50 percent negative rating). At this point, President Obama, with a 53 percent disapproval rating, is less popular than his predecessor. But Republican primary voters are likely to have more conservative options, which could be a problem for Bush, who has embraced some more moderate positions. As Florida governor, Bush backed Common Core, a state-driven education initiative on which conservative activists have soured. He has urged states to stick with the standards. While the law was created with sweeping bipartisan support, it is now nearly radioactive for Republicans since President Obama tied federal funds to Common Core. The rest of the likely GOP field all oppose the law. But Bush would enter the primaries with significant advantages. He could capitalize on the years of relationships his family has built in Republican politics. That means an easier time fundraising and finding experienced campaign staff. He also could wedge another candidate out of the race. There has long been speculation that both Jeb Bush and Sen. Marco Rubio wouldn’t run for president. The two Florida Republicans have strong personal ties and a long history that would keep them from facing off directly in a campaign. And Bush -- who is the son and brother of presidents and the grandson of a senator -- may, ironically, be able to portray himself as an outsider more successfully than some of his potential opponents. Rubio, Rand Paul and Ted Cruz have all spent time in the Senate, making them vulnerable to the perception that they are Washington insiders. Bush's time as a governor could also be a boost, since Republicans have spent the past six years criticizing Obama for a lack of executive experience. Jeb Bush was popular among Hispanics in Florida while governor. He's a Roman Catholic who speaks fluent Spanish. His wife Columba was born in Mexico. If Bush's position on immigration doesn't doom him in the primaries, it could help him in the general election. Mitt Romney struggled with the immigration issue after he moved to the right in the primary. He felt the backlash in the general election when he failed to win over Latino voters. At this point, Hillary Clinton beats all GOP candidates in a hypothetical general election matchup. But Bush does about as well as other leading Republicans. He trails Clinton by about 10 points, according to an aggregate of polls by Real Clear Politics. New Jersey Gov. Chris Christie trails her by about 9.4 points and Paul is behind the Democrat by 8.5 points. Republicans are likely to look at the Democratic nominee while choosing their own. That could help Bush because family baggage and "dynasty fatigue" are far less of an issue for him if Clinton is also in the race.